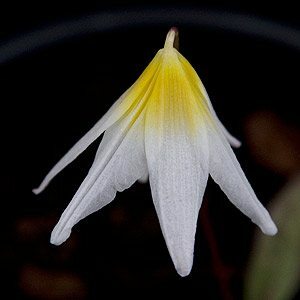 A wonderful species, Erythronium helenae probably deserves a little more recognition than it gets. Originally from California and a little north into Oregon this little woodlander with its lemon yellow flowers is relatively rare in Australia. From seed this is slow to get to flowering stage, maybe 8 years, so be patient. Although you could grow then in the ground, for such a rare beauty we suggest a pot or container, where you can keep an eye on them. We are always amazed when we go to repot that Erythronium helenae has pulled itself right down to the lower part of the pot. Like many it searches for that ideal combination of cool and moisture. As for buying them, sorry at present we cant help with that, you could try getting seeds from the UK, or maybe one of the plant collectors fairs. Provide a little protection from spring frosts and rain, and dappled shade is excellent. We do like to bring the pots closer to the house when the foliage first begins to appear so we can watch with fascination as Erythronium helenae bursts into flower. Propagaion is easist by division although also possible from seed best sown when fresh.